I am in Atami, sitting on the floor on four pillows with my back to the wall and trying to figure out whether all this up and down is really good for me. When I made all my hotel reservations I had trouble with Atami. All of the cheaper hotels were booked for the two nights I wanted. I wound up in a place you enter at the bottom of a steep hill in a Japanese style room. This was all a surprise to me. My hotel confirmation got printed out in Japanese. That should have been my first clue. Also a surprise is the lack of English speakers around here. This is supposed to be a famous resort, but not for us English speakers. The people at the info center were very nice, but no English. They directed me to the hotel, which seemed to be close to the station, but I had trouble following the map so I finally got a taxi. (Yes, Grace, it’s a great doctrine.) I couldn’t believe when he dropped me off. This place makes Pittsburgh look like flatland. Of course, I was too early for check-in time, but I left my small suitcase (I shipped the larger one to my next stop, Okayama), and went up a long stairway back to the station to get the bus to MOA, the famous Museum of Art. 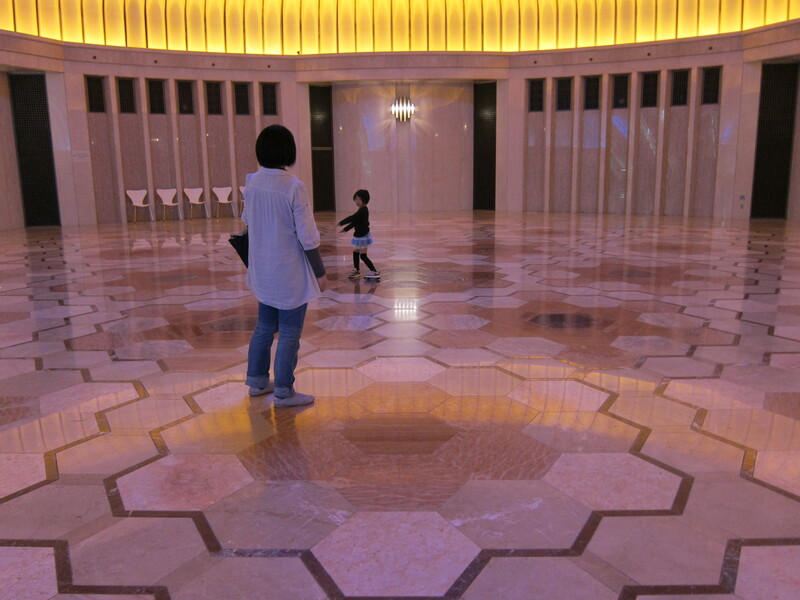 As with many contemporary museums the building is more impressive than the art they were showing. You enter the building, already high on a hill, and immediately get on an escalator. 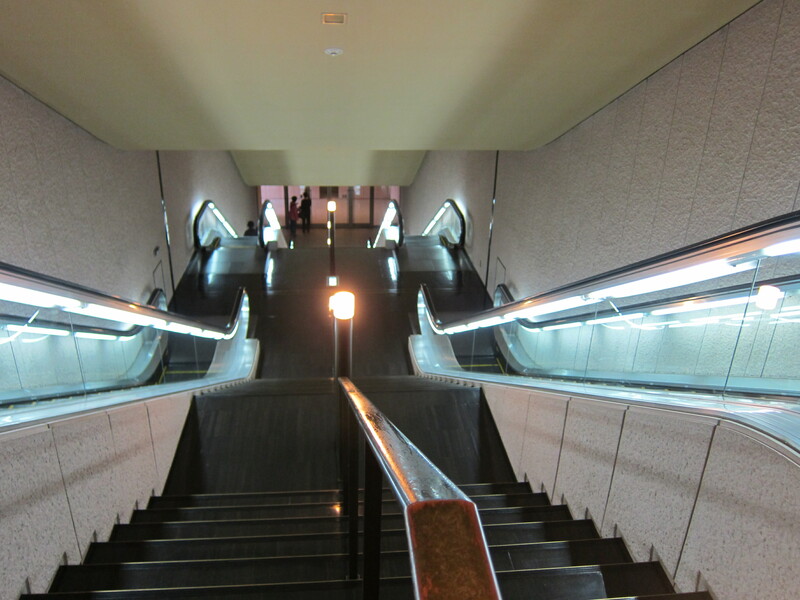 I didn’t count but I think there were six of them; very long escalators; 200 meters of escalators rising 60 meters. Very impressive, but ultimately boring. Various write-ups say they have 3500 Japanese paintings with probably only a hundred or so on display. I did see a lovely display of Rinpa art that I enjoyed. I managed to have three meals today. Breakfast in the train station was a small sandwich on white bread and a bottle of cold green tea. Lunch in the museum was tempura on rice. I really did not want tempura, which was greasy and stayed with me all afternoon, but they had no English menu and this was the best I could do with the waitress’s limited English. I am still surprised about it. I know that English gets more difficult outside of Tokyo and Kyoto, but Atami is supposed to be a famous resort. On my way back to the hotel I stopped at a 7-11 and got rice wrapped in seaweed and something that looked like it might be spinach with scrambled eggs. I’m a little concerned about the lack of green stuff here since I have my coumadin balanced on a certain amount of it. I was hoping seaweed would make up for it but no such luck. I think my jetlag is receding. It’s 7:45 and I’m still awake. First time since I arrived. It has been windy and threatening all day; sometimes I had trouble walking with the wind. It was supposed to rain but that never happened. Maybe tonight. I took my time getting out, finally going and getting some breakfast and walking around the hotel area. There are at least three shops selling beads and I found one place that purports to sell ivory. I thought that was banned. Or is that another whale area where Japan defies the world. I used the day to do several things that needed to be done, like laundry. I could have gone for another couple of days but this was a good opportunity. I also needed to get reserved seat tickets for the train trips I will be taking. With the help of a website I wrote out all of the details–date, time, to, from and train name and numbers for the first four trips. I took all this written data, including asking for window seats, to the train travel center and painlessly got my tickets. I didn’t have to understand the ticket agent and he didn’t have to understand me or the English language. I will have to do this for four more trips, but I need more information about getting from Hiroshima to Matsuyama. Hyperdia evidently doesn’t deal with boat trips and that’s what is needed going from the island of Honshu to the island of Shikoku. I’ll stop at another tourist info center or maybe I can research it on line. I am finding it very hard to be without my phone–not for calls–I’m not a big talker–but for information. My addiction is almost as bad as my addiction to food. So I keep looking for places I can use the phone. I am even willing to pay, but I think I’ll just have to get over it. Yesterday, at the tourist info center they told me I could use wi-fi in the train stations but I had to go and register. That was another place I went today. 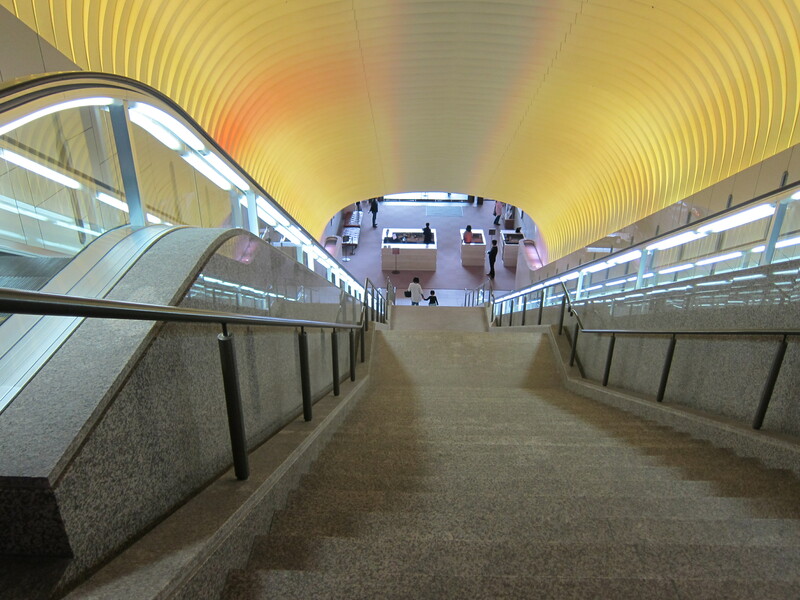 The train stations are massive and have all sorts of things in them: shops, restaurants, even art galleries. It sounded like a good deal. Well, it’s only good if you are in a hot spot; like in the tourist info center. I registered but I don’t think it will do me much good. Finally, I walked over to the Ozu Washi Paper Store, a maker of hand made papers. It was nice, but I’ve seen nicer. Just as well. If they had something I wanted I would have had to return the day before I was leaving Japan. But there is a good paper store in Kyoto. That will be much more convenient. The January thaw ended yesterday without the promised rain or snow. Yesterday and today are more nearly normal; temps in the 30’s, but very pleasant. I’m enjoying walking. Back to travel plans: I leave Atami by train, using my 21 day railpass, and going to Okayama where I have booked a hotel for three nights. 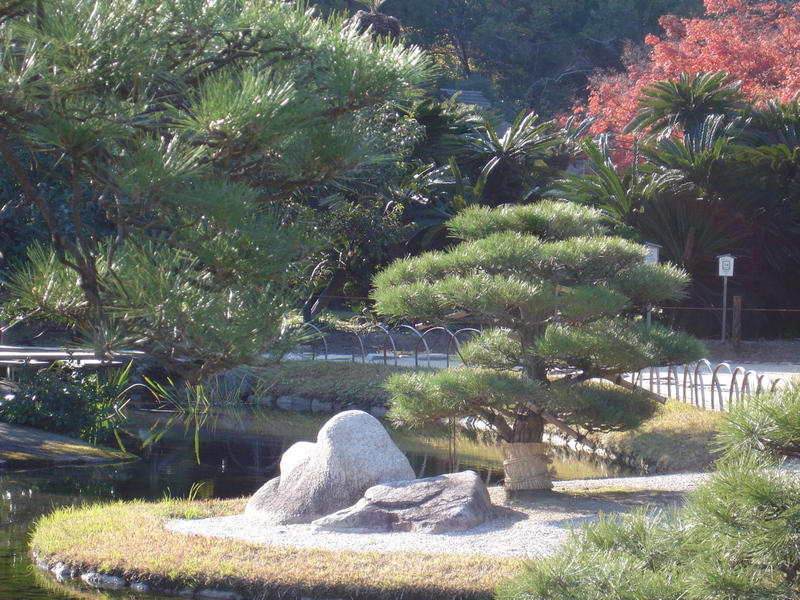 My primary destination will be Korakuen, one of the top three and a garden I visited in 2008 and didn’t love. Maybe spring will be better. 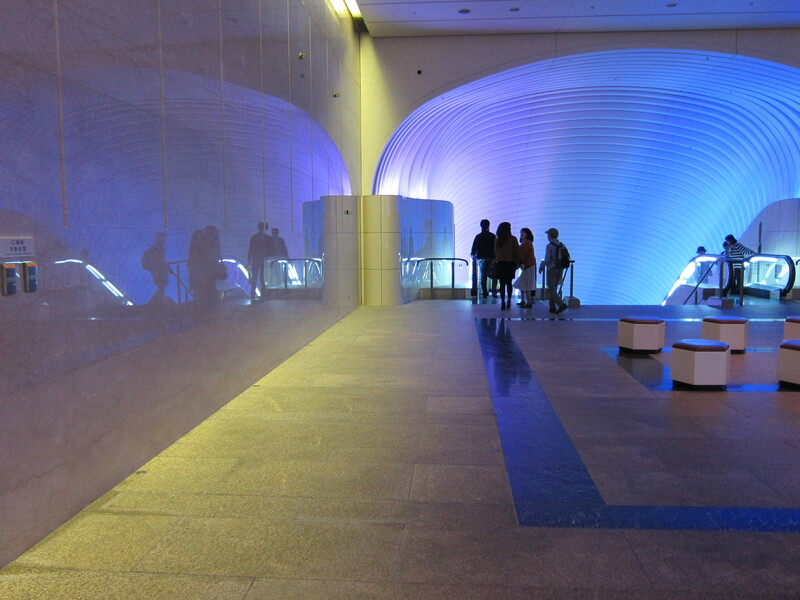 Okayama is on the Seto Inland Sea where several islands have become major contemporary art destinations. I plan to go to the art house project and Benesse House on Naoshima, Inujima Island and an art festival on these islands, which were originally industrial sites that have been recycled. From Okayama I will go to Fukuoka on the other large island, Kyushu, where there are several interesting destinations. Haven’t booked a hotel yet, so that’s next. It looks like it will take another 40 days to get settled. Probably longer; packing actually took me most of a year. 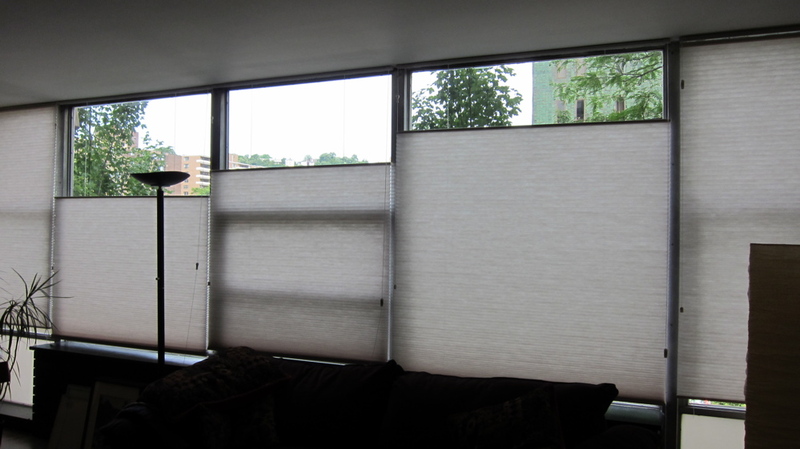 Bill hung a few pictures and installed the shades on Wednesday afternoon. He worked for two hours. I bought the kind you can raise from the bottom and lower from the top, the idea being I could hide the parking lot but still get lots of light and see the view. The bad part about the shades is the dust created by the installation. I spent much of Thursday and Friday cleaning. I’ll have to do it again when the shade for the door arrives. I was foolish not to have ordered it at the same time. I had trouble understanding how it would work. Bill told me you just raise it when you want to go out. I’m not much of an outdoor person; at least not in hot sunshine, so it probably won’t matter. Sari was here when Bill arrived and helped me get these pictures hung. Remember the wall with the green peacock feathers? This is the wall. Not so dazzling as the feathers, but much easier for me to live with. 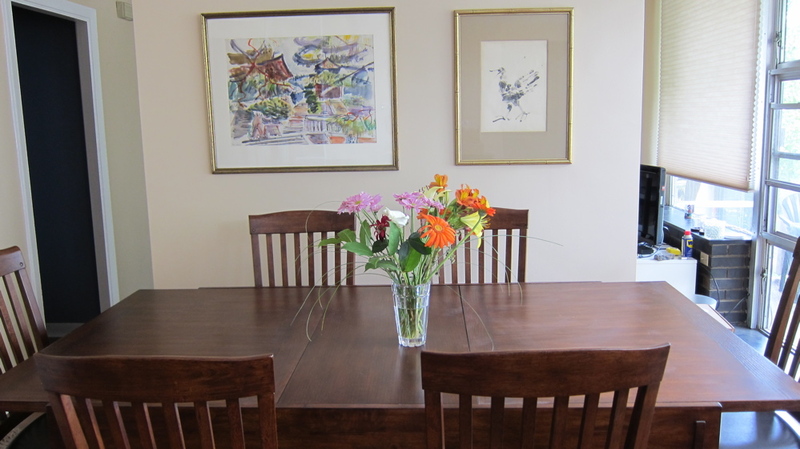 So I now have a living-dining room combination. I may replace the table and chairs with something smaller, but I’ve already spent so much money I won’t be ready to do it soon. While Sari was here she made some other suggestions about moving the furniture. She has a great eye. After I finished most of the dust removal from the living-dining room I started moving furniture. I was going to wait until I enticed a strong, young man to come and help me (ha ha!) but decided I couldn’t wait any longer. With the help of those large coaster things, I think called Move-alls, and lots of hard work, I did the job. Sari suggested switching the rugs, requiring removing the furniture from each and rolling up the rugs. I removed all the shelves and drawers from the two large cabinets, put the Move-alls under them and pushed them off the rug. I had to remove the table and chairs and the coffee table, then figure out where to put all the stuff so I could get the rugs laid again. Anyhow, I survived and I’m very happy with the result. It now feels like an orderly room. Still have to hang the rest of the pictures–next week, I hope. The point of all this, besides making me feel good, was to be able to put things in the two cabinets. I decided to put the books and pottery I made behind the glass doors. Then I put some of my larger art books on one of the open shelves and freed up some space that was badly needed in the other bookcases. 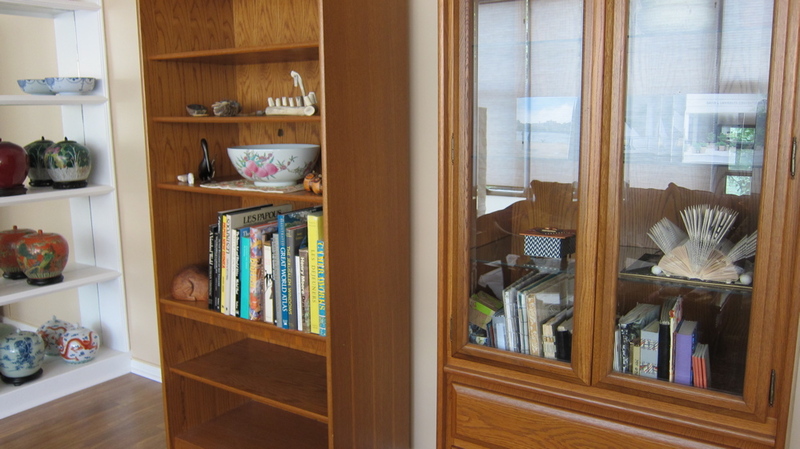 Also moved a few pieces from the built-in shelves, which were much too crowded. After that I was able to get all the books put away, more or less by subject matter, oversize items not included. When I removed the drawers from the cabinet I found the opera glasses that I hadn’t seen for at least twelve years. I knew I owned them and couldn’t figure out what happened. For years, each time I went to a play or opera I searched for them, finally giving up when I moved to Pittsburgh. I’ve started pulling other drawers hoping to find the MP3 player I haven’t seen for a year or more. One of the more annoying things, besides the concrete, was the radio. We have three public radio stations here, one classical music, one folk, pop and I don’t know what, and one news. I have for many years awakened to the news on public radio. In most of the apartment I could only get the classical music station. Only in the kitchen and bathroom, both rooms in the inner part of the apartment, was I able to tune in the news station. It’s been bothering me since I moved in. 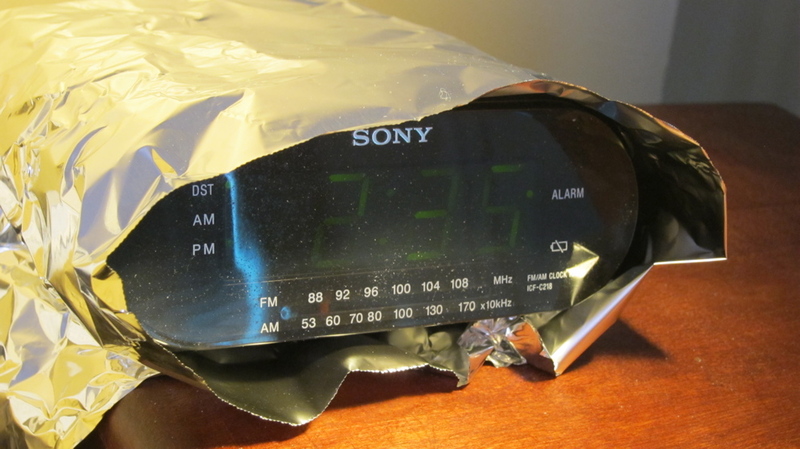 Today I decided to try wrapping the radio in aluminum foil. Voila, it worked and I am a happy woman. I don’t want to know how many days it takes me to unpack. The kitchen is mostly organized, not including the boxes of stuff I haven’t yet found. The picture is of my workroom. 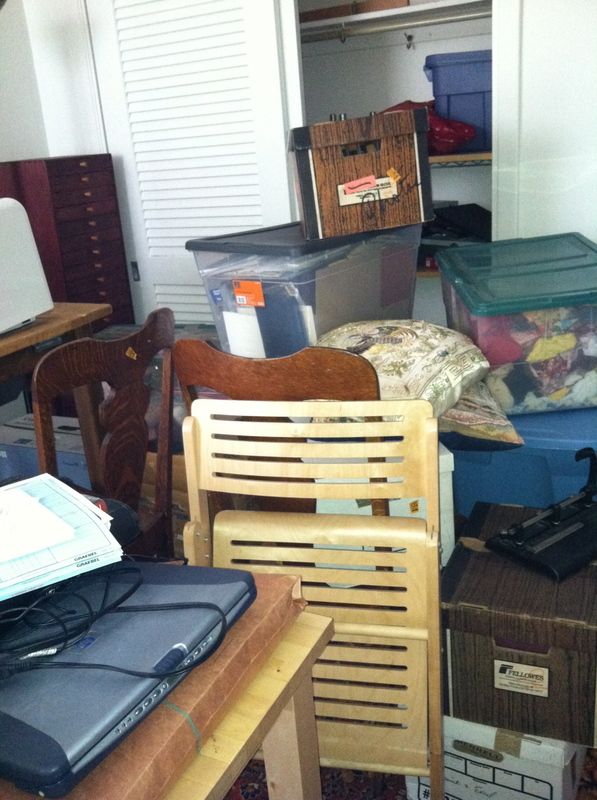 I began by removing four boxes to another room, but it didn’t help much. I’ve actually been taking it easy, following your instructions. Yesterday afternoon I went to a splendid movie: Best Exotic Marigold Hotel. It’s a wonderful portrayal of making the best of old age, along with some great views of India; something I’ll probably watch again. Finally went grocery shopping today. The cupboard has been very bare, but I was enjoying not have more stuff to put away. However, I do like to eat. I thought about going last night but just walked down the street and got a sandwich from EatUnique, my favorite restaurant. One of the virtues of my new location is that I can just walk one or two blocks and get something to eat or have something to do. I’m enjoying it already. I have seven bookcases and I’ve begun loading them. Unfortunately I’m not sure how to divide the books: which books go in what room. I have a terrible feeling this could go on for a long time. Tomorrow morning I have class again. I’m grateful for the distraction. The move went smoothly, just as the apartment redecorating. If I believed in omens, I would say this was truly meant to be. For the week and a half before the move a small truck was parked about two feet closer to my driveway than would be comfortable for the moving van. I don’t know which of my neighbors owns the truck, but I kept wishing it would go away. I was prepared to position my car in such a way as to capture two parking spaces and leave it there until the movers came. Having a driveway would make that possible. But the truck didn’t move. On Thursday, moving day, I was up about 6am, getting ready. At 7:30 I just happened to look out the window: the truck was gone. What a great thing: it made everything much easier. The movers arrived about 8:30 and worked hard until finishing at noon. We drove to the new place and they worked hard again until 4. When the truck first arrived, my neighbor, Mary, came over and asked if I needed help. She agreed to come with me to the new place. I think it would have been very difficult without her. She was really wonderful and again I felt particularly blessed. Later Ivetta came after her ESL class and also helped out. Of course, after the movers finished we had 98 boxes to cope with. Also, while I had planned most of this very carefully, I really screwed up at the end. I had run out of one of my cardio meds, got the scrip refilled, threw it into a box and couldn’t remember what I did with it. I knew it was in a kitchen box; there were only about 12 of those, but we had to find them and we weren’t getting there. My telephone rang and it was the “concierge” from my health insurer, wishing me a happy birthday. He asked if there was anything he could do for me. I suspect he’ll never ask that question again. He was very good and got special dispensation for me to have the scrip refilled again. So I was able to take the meds for that day and the next morning then finally found the original bottle. At this point, two days later I have unpacked about 25 or 30 boxes. The kitchen is almost finished and I’ve started on the bookcases, since most of the boxes contain books. This afternoon Robin, Steve and I went over to the old apartment to clean it up and remove food and a few last items. I couldn’t have done it without them. So, I am now entirely relocated. I left the keys and look forward to getting my security deposit returned. My workroom is impassable; I can barely make my way to the computer. Comcast sent me the wrong modem, so the computer has to be tethered and I can’t sit in bed and use the toy. They promised to fix it. My dining room, which will become my computer room was so filled with boxes I couldn’t walk from one side to the other with going into the living room. It’s much better now that I’ve unpacked so many boxes. That’s where I’ve been concentrating; that’s where most of the kitchen boxes were. My bathroom and bedroom are in decent shape and that’s where I’m headed now. I’ve never gone to bed so early, so often.